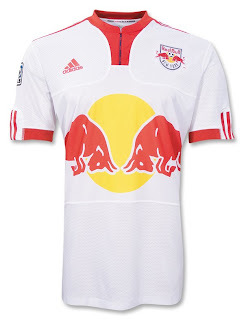 Adidas has created one of their design templates for the 09/10 season (yes, other teams will feature some aspects of this design) and it’s evident here in the newest Red Bulls 09/10 Home Short Sleeve Soccer Jersey. The design features what look like breastplates made of breathable mesh, which is also on the sleeves and lower portion of the shirt. However, what you’ll love most about this shirt is surely the collar. The unique, mandarin-style collar somewhat resembles the collar on many rugby jerseys of late; and it looks like it has a zipper down the middle. It doesn’t. However, it is ribbed for maximum flexibility. As usual, the Bulls jersey includes the MLS patch embroidered on right sleeve, team crest and adidas logo embroidered on the chest, as well as ribbed sleeves. Made with ClimaCool® - advanced material engineered to reduce heat and moisture build-up, allowing increased comfort and performance – to keep you feeling fresh no matter how long the big Bulls match goes on!